Don’t let your precious travel memories be stuck on your camera, phone or computer and seldom be seen. Celebrate your travel adventures and present your photos in a way that everyone can enjoy. Create a beautiful Travel Photo Book. Today, it is easier than ever to create a custom, travel photo book that will creatively chronicle your adventures, communicate the essence of the special places you have seen and convey the feelings associated with your experiences. You will have a photo book that not only records the significant events in your travels; it will also captivate wide audiences and be worthy of the finest coffee tables. Think of your Travel Photo Book as just that, a book that tells a story. It should not be a comprehensive chronicle of every person or thing that was photographed on your trip. Most of us take hundreds of pictures when we vacation. The easiest way to organize your travel photos is to create a separate folder for each day, location or event. 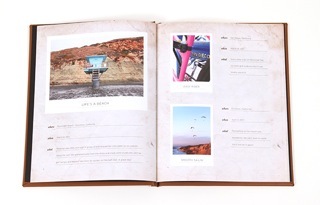 Select the best of these to include in your Travel Photo Book and put them in an order that tells your story. Less is more. Think of the most beautiful travel books you have admired. They usually limit the number of photos to 1-3 photos per 2-page spread. Too many photos fight for attention and ultimately will confuse the message you want to convey. But as with all guidelines, there are exceptions. Some spreads work better with a somewhat denser layout such as action. For instance, a flight down a zip line may be conveyed with time-lapsed shots showing your progression on the line. Negative space is a good thing. It is easier to design with white space than to try and fill the page with photos that must all fit together like a jigsaw puzzle. And negative space focuses the eye on the photo. Remember that “less is more” bit from Tips #2 and 3? That applies to how long your Travel Photo Book is. Your book can be deemed perfect when nothing can be removed without losing part of the story and nothing can be added without feeling repetitive. And consider that each spread should have it’s own theme or portray one event or a portion of an event. You have heard the phrase that “You can’t tell a book by its cover.” You have probably also heard “You only get one chance to make a first impression.” The cover of your Travel Photo Book will set the tone for what is on the inside. Whether you want to convey the excitement of a white water rafting trip, the exotic nature of a photo safari or the relaxing beauty of a secluded tropical island, set the tone of your book with the right cover design. You have many options for materials and treatments for your book cover. You may choose a photo cover, a leather cover with a hot-foil stamp, or an elaborately designed work of art. There are many companies that offer pre-designed templates – some better than others. Find a template that is easy to work with (drag and drop for text and photos) and presents your photos in a way that helps to convey the story of your travel. We recommend against using gimmicky graphics that distract from the photos themselves. If you want your Travel Book to have a prominent spot on your coffee table, select a publisher with inhouse state-of–the-art digital printing and high-end bindery capabilities. They will assure your printed images are crisp and vibrant and your book is professionally bound. This is where we get to put in a little plug for the professional designers at CLEARSTORY. Let our designers create a custom Travel Book that will live up to the vacation of your dreams. Simply meet with an experienced CLEARSTORY book designer and describe the type of book you want. We’ll show you examples, guide you through your options and provide design ideas. Then – and this is the best part – we’ll do all the work!